Want a gorgeous style that’ll make a splash? 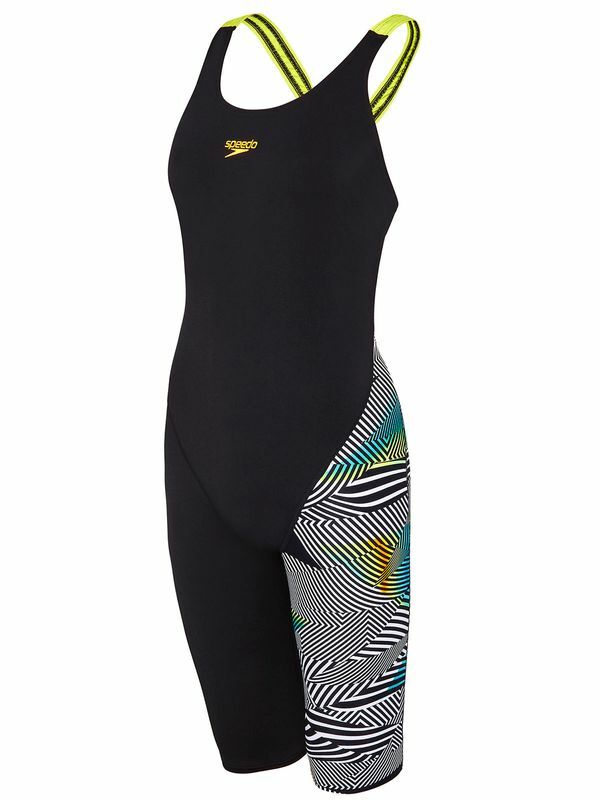 You are going to want to dive head first into the flashy Speedo Sound Waves Women’s Kneelength. This sleek midnight black look features a neon tangerine Speedo logo at the front and centre along with a vibrant chartreuse green accent straps in back. With one black and white geometric print accent leg with splashes of lemon, topaz, azure, and shamrock, this knee length look has it all. Made for the needs of female swimmers with crazy training schedules, the Speedo Sound Waves Women’s Kneelength is a dream come true. Made with four-way stretch technology, this swimsuit fits like a second skin! Sound Waves Womens Kneelength manufactured by Speedo Swimwear the worlds leading swimwear brand. Speedo is passionate about life in and around the water, creating revolutionary new technologies, designs and innovations.